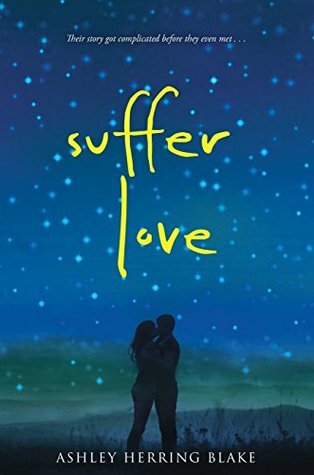 I may have had this book on my TBR list for a while (honestly, there are so many I lose track) and so when I saw something on Twitter about Suffer Love being $2.99 I grabbed it. Sam's in a new town and his life is kind of...not that great. His parents are split up and they blame him for something that's kinda-sorta not good. Hadley and Sam are immediately attracted to each other in that way that teenagers are. He thinks she's beautiful and there's something about her that draws him in. It's the same for Hadley, only she's gotten herself into a situation that isn't very flattering. Despite their differences Sam and Hadley manage to become friends and eventually more than friends. Only Sam has a pretty big secret. This isn't really a secret that the author doesn't want you to know. It's pretty clear early on in the story what Sam and Hadley have in common and that it isn't something that is going to come full circle for a while. Despite that secret, this is a fun but moving story. Hadley and Sam are both dealing with too much for teenagers to deal with but they find a solace in each other. Their relationship is sweet without a lot a drama between the two of them. There are a few instances when tempers flare (mostly from Sam) but a lot of it has to do with his holding onto this thing that he knows but doesn't want to share yet. I kind of hated the way that it came out because I'd really come to dislike Sam' mom. This story is full of big characters who all play an intricate part in the unfolding: Sam's sister, Hadley's best friend, both of their parents. I feel like this story is ultimately about healing and that it isn't something that can be done alone. I definitely fell in love with these characters and you might too.